The Marine Corps has the fewest number of female service members. camera (Makenzie Fallon/U.S. 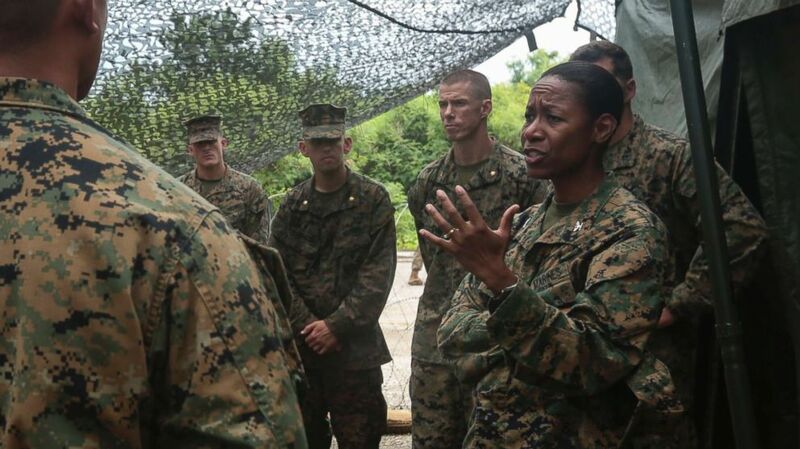 Marine Corps) U.S. Marines listen to Colonel Lorna Mahlock on a visit to the Northern Mariana Islands, Sept. 14, 2016. Secretary of Defense James Mattis announced a historic nomination Tuesday. If confirmed, Marine Corps Col. Lorna M. Mahlock will be the first black female to serve as brigadier general, according to the Marine Corps office of public affairs. Right now, Mahlock is the deputy director of operations, plans, policies and operations directorate at the Marine Corps' headquarters in Washington, D.C., according to a press release. The Marine Corps is the smallest of the four military services, and the branch has the fewest female service members, according to the Marine Corps Community Services. Women make up just 8 percent of the Marine Corps, but that percentage is likely to increase, according to Gen. Glenn Walters, the assistant commandant of the Marine Corps. Last year, the Marine Corps made history by welcoming its first female infantry officer. The woman, who wished to be unnamed, was the first female to finish training for a military occupational specialty (MOS), which was opened up to women in April 2016. And it was only three years ago when the Pentagon historically made all combat jobs available to women.